There’s nothing better than a day spent fishing in Alaska. Clean, fresh air, a day on the water with family and friends and at the end of the day plenty of fresh fish to enjoy. We fill our freezer every year with as much locally caught Alaska salmon, halibut and cod as we can. We feel so lucky when we open our freezer in the winter, not only are we about to enjoy eating Alaska Seafood, but it’s so healthy for us too. And thanks to the State of Alaska, and our founders who had the sense to write sustainability into the constitution, we still have plenty of Alaska Seafood to share with the rest of the country. Now I grew up taking our incredible state for granted, I used to groan and say “salmon AGAIN! ?” but my how times have changed, I sure love our abundant seafood now. 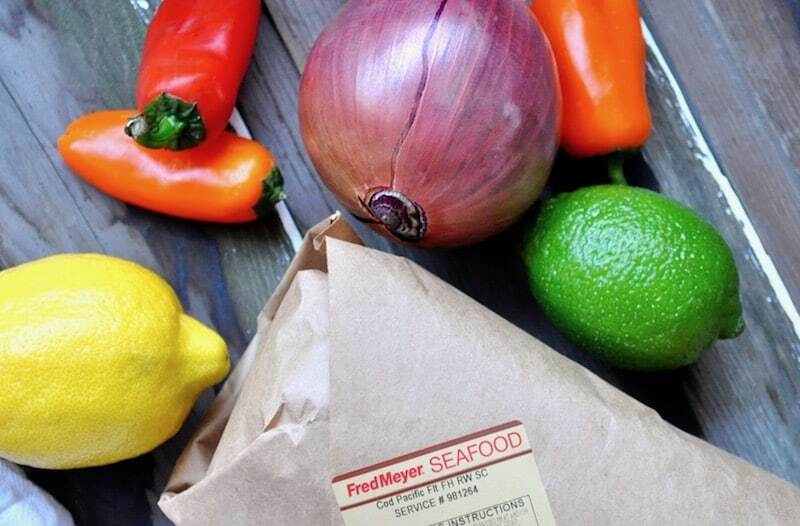 Thankfully the preparation has changed as well, Alaska Seafood can go just about anywhere traditional meat can go, like on the grill, in sandwiches, over salads, and our new family favorite Alaska Cod Sheet Pan Fajitas. 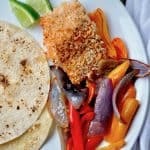 These fajitas make for a faultless weeknight dinner, they’re fast, healthy (for you and the environment) and only require ONE PAN. Ok, fine you’ll need a small skillet for crisping up your tortillas but other than that ONE SHEET PAN. Fish Fajitas for the WIN! What’s the one thing we all need more of on weeknights? Yes, that’s right, time. 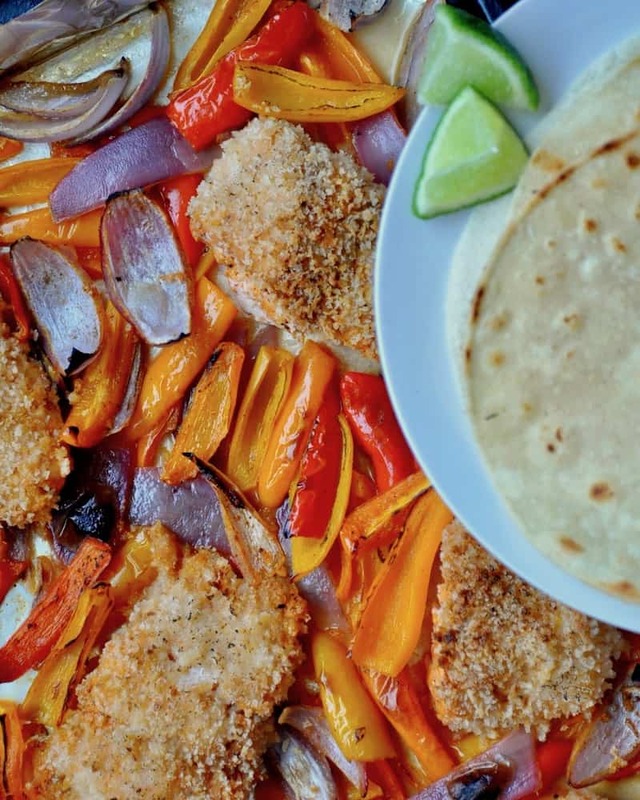 Well, these Alaska Cod Sheet Pan Fajitas are going to give you that. 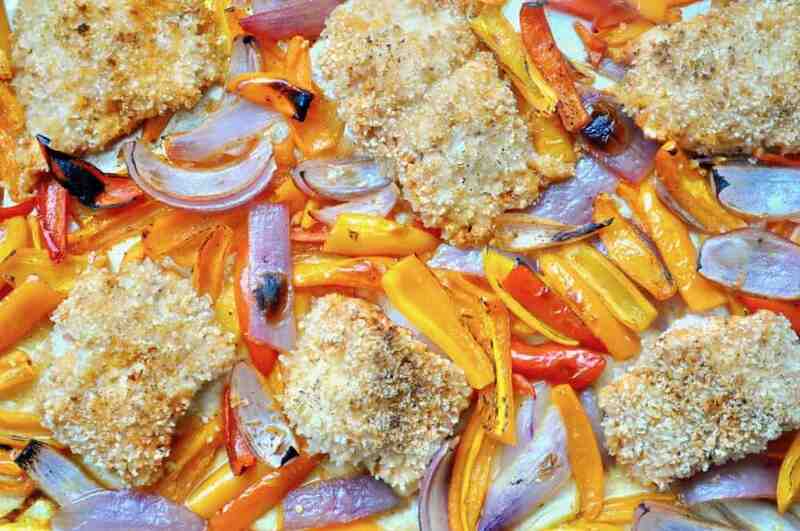 The vegetables can be chopped with the fish quickly marinates. Then it’s in the oven you’re on a countdown to dinner. This leaves just enough time to warm up some beans or make an easy salad, get the table set, and crisp up some tortillas. Quick weeknight dinners are life! I like to put my kids to work in the kitchen with me; it’s a great way to download our days while working to make a meal together. Let’s talk healthy! Enjoying fresh seafood every week that’s rich in the essential Omega 3 fatty acids not only promotes healthy hearts and brains while it reduces inflammatory responses in the body.  But if you’re interested in healthy, you should also know that Alaska Seafood comes from clean, protected waters in Alaska. Healthy ecosystems make for healthy seafood which promotes healthy lives; it’s all connected. Did you know that sustainability is the law in our state? It’s written right into our state constitution, where it says that our fisheries MUST be sustainably managed. How do you sustainably manage something so big, that if you laid it out, it would stretch from coast to coast and top to bottom on the continental United States? Checks and balances for starters and then each fishery is tightly controlled so that nothing gets overfished and overlooked. If there’s a low harvest step are immediately take to preserve that fishery as much as possible. See all of the reasons to #askforalaska when you’re at the store? Sheet pan Dinners are probably one of my favorite ways to make dinner. EVER. And I have an Instant Pot! What’s better than putting everything on one sheet pan and cooking it all together? Not much except well maybe cleaning up afterward? Seriously one pan and if you cover it well enough, you may not even have much of a mess left in it to clean up. 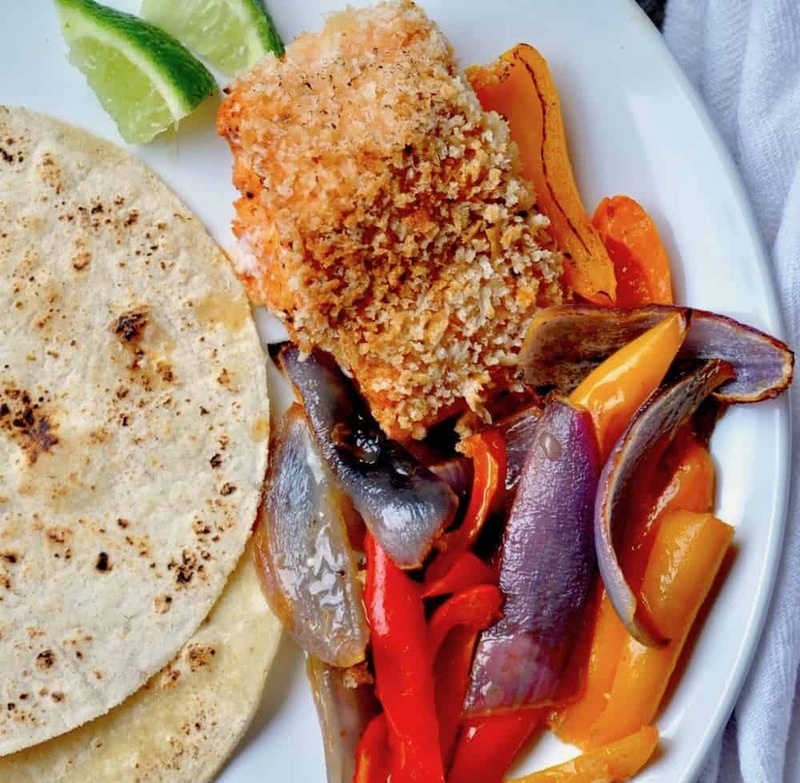 Give yourself the gift of time with this healthy, one pan weeknight dinner recipe, Alaska Cod Sheet Pan Fajitas featuring sustainable cod from Alaska. Do you enjoy Alaska Seafood? What’s your favorite? 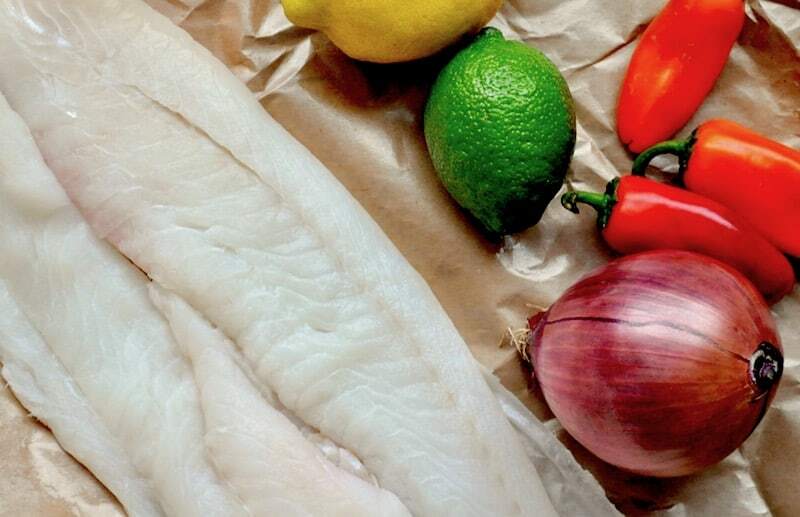 I’m a huge fan of Alaska halibut and Alaska cod; we eat a lot of Alaska Salmon too. Got a favorite recipe? As probably know by now I’m aways looking for new ways to enjoy Alaska Seafood so please feel free to share! And here’s a link to My Top Nine Favorite Alaska Seafood Recipes if you’re interested. 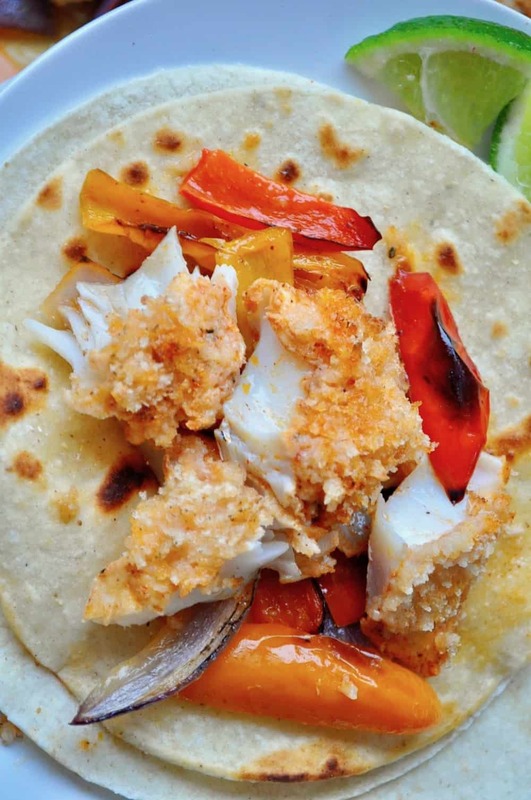 I’m a big fan of fish tacos and these ones look super yummy! Wow! We made them tonight and they are so easy and amazing. Definitely going to be something we eat often. I love sheet pan dinners! Looks yummy! PINNED! I love sheet pan dinners! Cod is another favorite in our house!